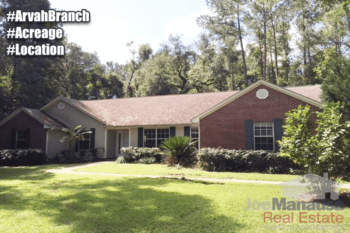 Arvah Branch is a smaller neighborhood located in NE Tallahassee filled with executive level homes on one to five acre parcels. You'll find this hidden gem of a neighborhood north of I-10 off of Miccosukee Road. Buyers seem to love the style of homes mixed with the larger lots upon which they were built (think location + land). With just under one hundred homes, Arvah Branch produces few enough home sales to get solid trend lines formed for prices and values, so it takes a little more local knowledge to identify the fluctuations that we see in the data. In this report, we examine home prices, values, and sizes in Arvah Branch, as well as the current listings in the Tallahassee MLS and all closed home sales going back to 1991. It is important to note that the narrative contained below is for sales through December for all previous years, but through the third week in March 2016. The graphs and the closed sales table will be continuously updated into the future (meaning bookmark this page if you always want to know the current status of homes in the Arvah Branch). Average home prices fell roughly 12% in 2015 compared to home prices in 2014, which explains why home sales activity was the second best of the past nine years. The average home sales price in Arvah Branch in 2015 was $214,900, and through this writing there has only been one home sold this year. Since this one sales was new construction on a lake, it sure makes our graph explode when we see the "average" home price shoot up to $370,000. Average home values in Arvah Branch declined 14% in 2015 due the high number of distressed sales (3 of the 7 homes sold were distressed, a rate that is roughly double what the rest of Tallahassee averaged for distressed sales in 2015). Currently, there is just one home on the market in Arvah Branch, and it is already under contract. Since it is not on the lake and it not brand new, you can expect to see it bring down this year's "average" home value thus far. The average home value in Arvah Branch was $101 per square foot last year, a level which was 32% below the peak of the market values recorded in 2007. This means that many homeowners who have purchased or refinanced in the past 10 years remain in negative equity situations, and that's why many of the home sales have been distressed sales (and why more are likely in the near future). The average home size sold in Arvah Branch typically falls in a range of 1,800 to 2,400 square feet, and the sales in 2015 fell near the middle of this range. The 7 homes sold in 2015 averaged 2,146 square feet, while the one home sold thus far in 2016 was 2,033 square feet. I hope you enjoyed our March 2016 update on home sales in Arvah Branch, please feel free to drop me a note if you have questions not covered in this report.